Sri Lanka has said it will temporarily open the main road to the Jaffna peninsula to allow supplies to reach 500,000 civilians trapped by fighting. 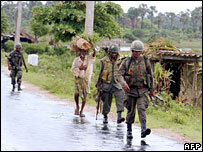 The road has been closed since August when heavy fighting began between Tamil Tiger rebels and government forces. The president's office said the opening of the A9 highway was a one-off. The government has been under pressure from aid agencies to allow relief through. Rebels say the move is a gimmick aimed at influencing key foreign donors. Meanwhile, shops and businesses were shut in the northern town of Vavuniya in protest at the killing of five students on Saturday. The students were shot dead at close range after a rebel landmine nearby killed five soldiers. Ceasefire monitors said security forces opened fire "indiscriminately" on the students. The authorities say the students were caught in cross-fire between troops and rebels. The navy and the Tamil Tigers both say they inflicted losses during a heavy sea battle over the weekend. Peace talks broke down last month in Geneva over the issue of the highway. The rebels said they would not agree a date for more negotiations until the A9 road was re-opened. The government has rejected the rebel demands, saying the Tigers want access to the area, to the north of the island, simply to levy taxes. Both local and international organisations have appealed to the government to open the route to the northern peninsula as shortages have worsened. The president's office said in a statement that monsoon rain, rough seas and the security situation had hampered the delivery of supplies to the peninsula by sea. It said a convoy of trucks carrying essential goods would be assembled with the help of humanitarian organisations for a one-off delivery to Jaffna. The Tamil Tigers said the government move was timed to coincide with a meeting in Washington on Monday of foreign donors who have pledged billions of dollars to help rebuild Sri Lanka. The aid is contingent on peace. Government forces and rebels have frequently clashed on land and at sea this year as a threadbare ceasefire, agreed in 2002, has unravelled. Violence has claimed more than 3,000 lives since the end of last year, the government says, although the rebels dispute the number of their fighters killed. Despite the bloodshed, both sides maintain that they are committed to the ceasefire, which now exists only in name. Most observers believe they were brought to the failed peace talks last month only as a result of international pressure. About 65,000 people were killed in fighting before the 2002 truce was agreed. The rebels want a homeland for minority Tamils in the north and east. They say Tamils have been discriminated against by the island's majority Sinhalese community.